The increasing number of genetic association studies conducted in multiple populations provides unprecedented opportunity to study how the genetic architecture of complex phenotypes varies between populations, a problem important for both medical and population genetics. Here we develop a method for estimating the transethnic genetic correlation: the correlation of causal variant effect sizes at SNPs common in populations. We take advantage of the entire spectrum of SNP associations and use only summary-level GWAS data. This avoids the computational costs and privacy concerns associated with genotype-level information while remaining scalable to hundreds of thousands of individuals and millions of SNPs. We apply our method to gene expression, rheumatoid arthritis, and type-two diabetes data and overwhelmingly find that the genetic correlation is significantly less than 1. Our method is implemented in a python package called popcorn. Many complex human phenotypes vary dramatically in their distributions between populations due to a combination of genetic and environmental differences. For example, northern Europeans are on average taller than southern Europeans1 and African Americans have an increased rate of hypertension relative to European Americans2. The genetic contribution to population phenotypic differentiation is driven by differences in causal allele frequencies, effect sizes, and genetic architectures. Understanding the root causes of phenotypic differences worldwide has profound implications for biomedical and clinical practice in diverse populations, the transferability of epidemiological results, aiding multi-ethnic disease mapping3,4, assessing the contribution of non-additive and rare variant effects, and modeling the genetic architecture of complex traits. In this work we consider a central question in the global study of phenotype: do genetic variants have the same phenotypic effects in different populations? While the vast majority of GWAS have been conducted in European populations5, the growing number of non-European and multi-ethnic studies4,6,7 provide an opportunity to study genetic effect distributions across populations. For example, one recent study used mixed-model based methods to show that the genome-wide genetic correlation of schizophrenia between European and African Americans is nonzero8. While powerful, computational costs and privacy concerns limit the utility of genotype-based methods. In this work, we make two significant contributions to studies of transethnic genetic correlation. First, we expand the definition of genetic correlation to better account for a transethnic context. Second, we develop an approach to estimating genetic correlation across populations that uses only summary level GWAS data. Similar to other recent summary statistics based methods99–20, our approach supplements summary association data with linkage disequilibrium (LD) information from external reference panels, avoids privacy concerns, and is scalable to hundreds of thousands of individuals and millions of markers. Unlike traditional approaches that focus on the similarity of GWAS results21–25 we utilize the entire spectrum of GWAS associations while accounting for LD in order to avoid filtering correlated SNPs.
) as the correlation coefficient of the population-specific allele variance normalized SNP effect sizes. will be close to 1. While other definitions of the genetic correlation are possible (see discussion), these quantities capture two important questions about the study of disease in multiple populations: to what extent do the same mutations in multiple populations differ in their phenotypic effects? And, to what extent are these differences mitigated or exacerbated by differences in allele frequency? To estimate genetic correlation, we take a Bayesian approach wherein we assume genotypes are drawn separately from within each population and effect sizes have a normal prior (the infinitesimal model27). While unlikely to represent reality, this model has been used successfully in practice8,16,17,28,29. The infinitesimal assumption yields a multivariate normal distribution on the observed test statistics (Z-scores), which is a function of the heritability and genetic correlation. Rather than pruning SNPs in LD10,30,31, this allows us to explicitly model the resulting inflation of Z-scores. We then maximize an approximate weighted likelihood function to find the heritability and genetic correlation. This method is implemented in a python package called popcorn. Though derived for quantitative phenotypes, popcorn extends easily to binary phenotypes under the liability threshold model. We show via extensive simulation that popcorn produces unbiased estimates of the genetic correlation and the population specific heritabilities, with a standard error that decreases as the number of SNPs and individuals in the studies increases. Furthermore, we show that our approach is robust to violations of the infinitesimal assumption.
. in RA and T2D, we find the genetic effect correlation to be 0.463 (0.058) and 0.621 (0.088), respectively. Across all phenotypes considered, we overwhelmingly find that the transethnic genetic correlation is significantly less than one. This observation highlights the need to study phenotypes in multiple populations as it implies that, up to the effects of un-observed variants, effect sizes at common SNPs tend to differ between populations. This indicates that GWAS results may not transfer between populations, and therefore disease risk prediction in non-Europeans based on current GWAS results may be problematic, necessitating a multi-population approach to gain insight into inter-population differences in the genetic architecture of complex traits.
. These optimizations are similar to those employed by LD score regression16. The full details of the derivation and optimization are provided in the appendix. We simulated 50,000 European-like (EUR) and 50,000 East Asian-like (EAS) individuals at 248,953 SNPs from chromosomes 1-3 with allele frequency above 1% in both European and East Asian HapMap3 populations with HapGen235. HapGen2 implements a haplotype recombination with mutation model that results in excess local relatedness among the simulated individuals. To account for this local structure, we used Plink236 to filter individuals with genetic relatedness above 0.05, resulting in 4499 EUR-like indivudals and 4837 EAS-like individuals. From these simulated individuals, 500 per population were chosen uniformly at random to serve as an external reference panel for estimating Σ1 and Σ2. , with K the population disease prevalence37. , as well as the number of individuals in each study (N1, N2), the number of SNPs (M), the population prevalence K, and proportion of causal variants (p) in the simulated GWAS and generated summary statistics for each study. The results shown in Figure 1 and Figure S1 demonstrate that the estimators are nearly unbiased as the genetic correlation and heritabilities vary. Furthermore, by varying the proportion of causal variants p we show that our estimator is robust to violations of the infinitesimal assumption (Figure S2). In figure S3, we show that the standard error of the estimator decreases as the number of SNPs and individuals in the study increases. Finally, we show in Table S1 that our estimates of the heritability of liability in case control studies are nearly unbiased. True and estimated genetic impact and effect correlation. All simulations conducted with simulated EUR and EAS heritability of 0.5 using 4499 simulated EUR and 4836 simulated EAS individuals at 248,953 SNPs. Our approach, as well as genotype-based methods such as GCTA, makes assumptions about the genetic architecture of complex traits. Previous work has shown that violations of these assumptions can lead to bias in heritability estimation38, therefore we sought to quantify the extent that this bias may effect our estimates. We simulated phenotypes under six different disease models. Independent: effect size independent of allele frequency. Inverse: effect size inversely proportional to allele frequency. Rare: only SNPs with allele frequency under 10% affect the trait. Common: only SNPs with allele frequency between 40% and 50% affect the trait. Difference: effect size proportional to difference in allele frequency. Adversarial: difference model with sign of beta set to increase the phenotype in the population where the allele is most common. Additional genetic architectures are possible, including ones where effect sizes are not a direct function of MAF39. to refer to the heritability of SNPs with allele frequency above 5% in both populations (the common-SNP heritability). Note, however, that one of the advantages of maximum likelihood estimation in general is that the likelihood can be reformulated to mimic the disease model of interest. True and estimated values of the genetic impact and effect correlation in simulated EUR-like and EAS-like genotypes. Results are the average of 100 simulations with phenotype heritability of 0.5 in each population. and genetic correlation estimates of popcorn to GCTA in the gEUVADIS dataset for which raw genotypes are publicly available. gEUVADIS consists of RNA-seq data for 464 lymphoblastoid cell line (LCL) samples from five populations in the 1000 genomes project. Of these, 375 are of European ancestry (CEU, FIN, GBR, TSI) and 89 are of African ancestry (YRI). Raw RNA-sequencing reads obtained from the European Nucleotide Archive were aligned to the transcriptome using UCSC annotations matching hg19 coordinates. RSEM was used to estimate the abundances of each annotated isoform and total gene abundance is calculated as the sum of all isoform abundances normalized to one million total counts or transcripts per million (TPM). For eQTL mapping, Caucasian and Yoruban samples were analyzed separately. For each population, TPMs were median-normalized to account for differences in sequencing depth in each sample and standardized to mean 0 and variance 1. Of the 29763 total genes, 9350 with TPM > 2 in both populations were chosen for this analysis. For each gene, we conducted a cis-eQTL association study at all SNPs within 1 megabase of the gene body with allele frequency above 5% in both populations using 30 principal components as covariates. We found that GCTA and popcorn agree on the global distribution of heritability (Figure S3), and that GCTA’s estimates of genetic correlation have a similar distribution to popcorn’s genetic effect and genetic impact correlation estimates (Figure 2). While the number of SNPs and individuals included in each gene analysis are too small to obtain accurate point estimates of the genetic correlation on a pergene basis (N=464, M=4279.5), the large number of genes enables accurate estimation of the global mean heritability and genetic correlation. 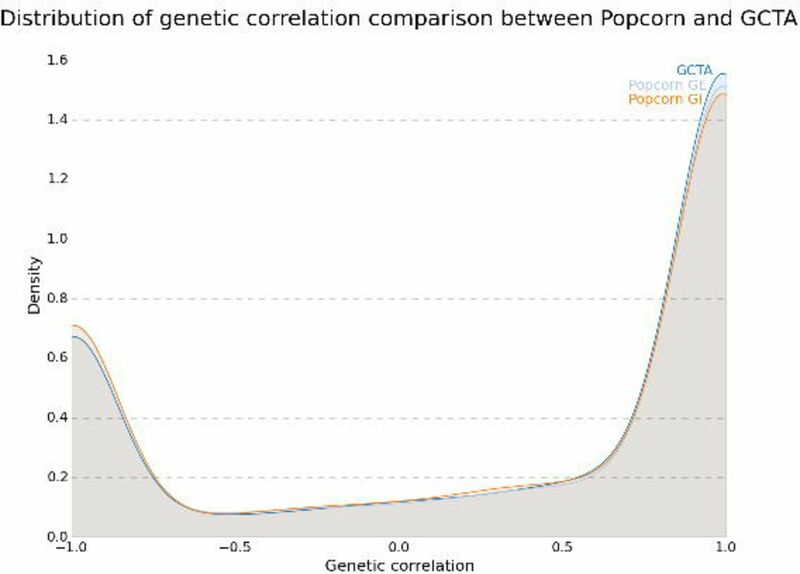 Distribution of genetic correlation comparison between popcorn and GCTA. Distribution was computed using a gaussian kde on the set of genetic correlation estimates. of the expression of the genes we analyzed was 0.093 (0.002) in EUR and 0.088 (0.002) in YRI. Our estimates are higher than previously reported average cis-heritability estimates of 0.055 in whole blood and 0.057 in adipose40, which could arise for several reasons. First, we remove 68% of the transcripts that are lowly expressed in either the YRI or EUR data. Second, estimates from RNA-seq analysis of cell lines might not be directly comparable to microarray data from tissue. of the gene is at least 0.2 in both populations the genetic effect correlation was 0.772 (0.017) while the genetic impact correlation was 0.753 (0.018). exceeding threshold h in each analysis (y-axis] is plotted against h (x-axis]. In order to verify that there were no small-sample size or conditioning biases in our analysis, we analyzed the genetic correlation of simulated phenotypes over the gEUVADIS genotypes. We sampled pairs of heritabilities from the estimated expression heritability distribution and simulated pairs of phenotypes to have the given heritability and a genetic effect correlation of 0.0 over randomly chosen 4000 base regions from chromosome 1 of the gEUVADIS genotypes. Without conditioning, the average estimated genetic effect correlation was -0.002 (0.003), indicating that the estimator remained unbiased. Furthermore, the average estimated genetic effect correlation was not significantly different from 0.0 conditional on the estimates of heritability being above a certain threshold (Figure S4). of the gene, indicating that as cis-genetic regulation of gene expression increases it does so similarly in both YRI and EUR populations. This may help interpret the recent observation that while the global genetic correlation of gene expression across tissues is low40, cis-eQTL’s tend to replicate across tissues41. As the presence of a cis-eQTL indicates substantial cis-genetic regulation, an analysis of eQTL replication across tissues is implicitly conditioning on the heritability of gene expression being high and therefore may indicate much higher genetic correlation than average.
. Furthermore, estimates of the heritability of T2D from family studies can vary significantly43,44. Heritability and genetic correlation of RA and T2D between EUR and EAS populations. EUR RA data contained 8,875 cases and 29,367 controls for a study prevalence of 0.23. EAS RA data contained 4,873 cases and 17,642 controls for a study prevalence of 0.22. RA disease prevalence was assumed to be 0.5% in both populations7. T2D EUR data contained 12171 cases and 56862 controls for a study prevalence of 0.18. T2D EAS data contained 6952 cases and 11865 controls for a study prevalence of 0.37. T2D EUR prevalence was assumed to be 8%33 while T2D EAS prevalence was assumed to be 9%48. We find the genetic effect correlation in RA and T2D to be 0.463 (0.058) and 0.621 (0.088), respectively, while the genetic impact correlation is not significantly different at 0.455 (0.056) and 0.606 (0.083). The transethnic genetic impact and effect correlation for both phenotypes are significantly different from both 1 and 0 (Table 2), showing that while there is clear genetic overlap between the phenotypes, the per allele effect sizes differ significantly between the two populations. We have developed the transethnic genetic effect and genetic impact correlation and provided an estimator for these quantities based only on summary-level GWAS information and suitable reference panels. We have applied our estimator to several phenotypes: rheumatoid arthritis, type-2 diabetes and gene expression. While the gEUVADIS dataset lacks the power required to make inferences about the genetic correlation of single or small subsets of genes, we can make inferences about the global structure of genetic correlation of gene expression. We find that the global mean genetic correlation is low, but that it increases substantially when the heritability is high in both populations. In all phenotypes analyzed, the genetic correlation is significantly different from both 0 and 1. Our results show that global differences in SNP effect size of complex traits can be large. In contrast, effect sizes of gene expression appear to be more conserved where there is strong genetic regulation. without selection. Differences in effect sizes at common SNPs can result from many phenomena. We expect un-typed and un-imputed variants differentially linked to observed SNPs to contribute significantly, along with rare or population-specific variants differentially linked to observed SNPs. If a gene-gene or gene-environment interaction exists, but only marginal effects are tested, the observed marginal effects may be different in each population due to allele frequency differences even if the interaction effect is the same in both populations, and this will result in decreased genetic correlation. While within-locus (dominance) interactions may also play a role45, the magnitude of this effect has been debated46. We emphasize that we cannot differentiate between these effects on the basis of this analysis alone, and further research is required to establish the magnitude of the contribution of each of these effects to inter-population effect size differences. (Appendix). Our observation that for RA, T2D, and gene expression the genetic correlation is low shows that out of population phenotypic predictive power is quite low. Similarly, it implies that disease risk assessment in non-Europeans based on current GWAS results may be problematic, necessitating increased study of disease in many populations to gain insight into differences in genetic architecture and improve risk assessment. and proportion of shared causal variants between the two populations. Interestingly, while our goal was to construct an estimator that determined the extent of genetic sharing independent of allele frequency, we observe that the correlation of genetic effect and genetic impact are similar. Furthermore, our simulations show that under a random effects model utilizing only SNPs with allele frequency above 5% in both populations the true genetic effect and genetic impact correlation are similar. We conclude that at variants common in both populations, differences in effect size and not allele frequency are driving the transethnic phenotypic differences in these traits. (a similar approach can be taken for the genetic effect correlation). Since LD-score regression has been successfully used to compute the genetic correlation of two phenotypes in a single population, this derivation can be viewed as an extension of LD-score regression to one phenotype in two different populations. The main difference in our approach is choosing maximum likelihood rather than regression in order to fit the model. A comparison of our method to the ldsc software shows they perform similarly as heritability estimators (Figure S5). Of course, our method is not without drawbacks. First, it requires a large sample size and large number of SNPs to achieve standard errors low enough to generate accurate estimates. Until recently large sample GWAS have been rare in non-European populations, though they are becoming more common. Similarly, reference panel quality may suffer in non-European populations and this may impact downstream analysis47. Second, it is limited to analyzing relatively common SNPs, both because having an accurate disease model is important for the analysis of rare variants and because effect size and correlation coefficient estimates have a high standard error at rare SNPs16. Third, our analysis is currently limited to SNPs that are present in both populations. Indeed it is currently unclear how best to handle population-specific variants in this framework. Fourth, our estimator of ρ is bounded between -1 and 1. This may induce bias when the true value is close to the boundary and the sample size is small. Finally, admixed populations induce very long-range LD that is not accounted for in our approach and we are therefore limited to un-admixed populations16.
. We expect that incorporating these parameters will improve estimates of heritability and genetic correlation while revealing important biological insights. Supplemental data include six figures and one table. The authors would like to acknowledge Lior Pachter and Hilary Finucane for insightful discussion about the problem. BCB is supported by the NSF GRFP. ALP is supported by NIH grant R01 HG006399. NZ is supported by NIH grant K25HL121295.
. We present a maximum likelihood framework for estimating the heritability of the phenotype in study 1 and it’s standard error, the heritability of the phenotype in study 2 and it’s standard error, and the genetic effect and impact correlation of the phenotype between the studies and it’s standard error given only the summary statistics Z1, Z2 and reference genotypes G1, G2 representing the populations in the studies. We assume that genotypes are drawn randomly from populations with expected correlation matrices Σ1 (and similarly for study two), and that every SNP is causal with a normally distributed effects size (though this assumption is not necessary in practice, see Figure S1). is the genetic impact correlation. SNPs to ensure that blocks are large enough to remove residual correlations. Robinson, M.R., Hemani, G., Medina-Gomez, C., Mezzavilla, M., Esko, T., Shakhbazov, K., Powell, J.E., Vinkhuyzen, A., Berndt, S.I., Gustafsson, S., et al. (2015). Population genetic differentiation of height and body mass index across Europe. Nat. Genet. 47, 1357–1362. Burt, V.L., Whelton, P., Roccella, E.J., Brown, C., Cutler, J.A., Higgins, M., Horan, M.J., and Labarthe, D. (1995). Prevalence of hypertension in the US adult population. Results from the Third National Health and Nutrition Examination Survey, 1988–1991. Hypertension 25, 305–313. Coram, M.A., Candille, S.I., Duan, Q., Chan, K.H.K., Li, Y., Kooperberg, C., Reiner, A.P., and Tang, H. (2015). Leveraging Multi-ethnic Evidence for Mapping Complex Traits in Minority Populations: An Empirical Bayes Approach. Am. J. Hum. Genet. 96, 740–752. Morris, A.P. (2011). Transethnic Meta-Analysis of Genomewide Association Studies. Genet. Epidemiol. 35, 809–822. Bustamante, C.D., De La Vega, F.M., and Burchard, E.G. (2011). Genomics for the world. Nature 475, 163–165. (2011). A genome-wide association study in Europeans and South Asians identifies five new loci for coronary artery disease. Nat Genet 43, 339–344. Okada, Y., Wu, D., Trynka, G., Raj, T., Terao, C., Ikari, K., Kochi, Y., Ohmura, K., Suzuki, A., Yoshida, S., et al. (2014). Genetics of rheumatoid arthritis contributes to biology and drug discovery. Nature 506, 376–381. de Candia, T.R., Lee, S.H., Yang, J., Browning, B.L., Gejman, P.V., Levinson, D.F., Mowry, B.J., Hewitt, J.K., Goddard, M.E., O’Donovan, M.C., et al. (2013). Additive Genetic Variation in Schizophrenia Risk Is Shared by Populations of African and European Descent. Am. J. Hum. Genet. 93, 463–470. Lee, S., Teslovich, T.M., Boehnke, M., and Lin, X. (2013). General Framework for Meta-analysis of Rare Variants in Sequencing Association Studies. Am. J. Hum. Genet. 93, 42–53. Palla, L., and Dudbridge, F. (2015). A Fast Method that Uses Polygenic Scores to Estimate the Variance Explained by Genome-wide Marker Panels and the Proportion of Variants Affecting a Trait. Am. J. Hum. Genet. 97, 250–259. Yang, J., Ferreira, T., Morris, A.P., Medland, S.E., Madden, P.A.F., Heath, A.C., Martin, N.G., Montgomery, G.W., Weedon, M.N., Loos, R.J., et al. (2012). Conditional and joint multiple-SNP analysis of GWAS summary statistics identifies additional variants influencing complex traits. Nat. Genet. 44, 369–375. Pasaniuc, B., Zaitlen, N., Shi, H., Bhatia, G., Gusev, A., Pickrell, J., Hirschhorn, J., Strachan, D.P., Patterson, N., and Price, A.L. (2014). Fast and accurate imputation of summary statistics enhances evidence of functional enrichment. Bioinformatics 30, 2906–2914. Hormozdiari, F., Kostem, E., Kang, E.Y., Pasaniuc, B., and Eskin, E. (2014). Identifying Causal Variants at Loci with Multiple Signals of Association. Genetics 198, 497–508. Hormozdiari, F., Kichaev, G., Yang, W.-Y., Pasaniuc, B., and Eskin, E. (2015). Identification of causal genes for complex traits. Bioinformatics 31, i206–i213. Kichaev, G., Yang, W.-Y., Lindstrom, S., Hormozdiari, F., Eskin, E., Price, A.L., Kraft, P., and Pasaniuc, B. (2014). Integrating Functional Data to Prioritize Causal Variants in Statistical Fine-Mapping Studies. PLoS Genet. 10, e1004722. Bulik-Sullivan, B.K., Loh, P.-R., Finucane, H.K., Ripke, S., Yang, J., Schizophrenia Working Group of the Psychiatric Genomics Consortium, Patterson, N., Daly, M.J., Price, A.L., and Neale, B.M. (2015). LD Score regression distinguishes confounding from polygenicity in genome-wide association studies. Nat Genet 47, 291–295. Finucane, H.K., Bulik-Sullivan, B., Gusev, A., Trynka, G., Reshef, Y., Loh, P.-R., Anttila, V., Xu, H., Zang, C., Farh, K., et al. (2015). Partitioning heritability by functional annotation using genome-wide association summary statistics. Nat Genet 47, 1228–1235. Bulik-Sullivan, B., Finucane, H.K., Anttila, V., Gusev, A., Day, F.R., Loh, P.-R., ReproGen Consortium, Psychiatric Genomics Consortium, Genetic Consortium for Anorexia Nervosa of the Wellcome Trust Case Control Consortium 3, Duncan, L., et al. (2015). An atlas of genetic correlations across human diseases and traits. Nat Genet 47, 1236–1241. Park, D.S., Brown, B., Eng, C., Huntsman, S., Hu, D., Torgerson, D.G., Burchard, E.G., and Zaitlen, N. (2015). Adapt-Mix: learning local genetic correlation structure improves summary statistics-based analyses. Bioinformatics 31, i181–i189. Xu, Z., Duan, Q., Yan, S., Chen, W., Li, M., Lange, E., and Li, Y. (2015). DISSCO: direct imputation of summary statistics allowing covariates. Bioinformatics 31, 2434–2442. International Schizophrenia Consortium (2009). Common polygenic variation contributes to risk of schizophrenia that overlaps with bipolar disorder. Nature 460, 748–752. Zuo, L., Zhang, C.K., Wang, F., Li, C.-S.R., Zhao, H., Lu, L., Zhang, X.-Y., Lu, L., Zhang, H., Zhang, F., et al. (2011). A Novel, Functional and Replicable Risk Gene Region for Alcohol Dependence Identified by Genome-Wide Association Study. PLoS ONE 6, e26726. Fesinmeyer, M., North, K., Ritchie, M., Lim, U., Franceschini, N., Wilkens, L., Gross, M., Bûzkovâ, P., Glenn, K., Quibrera, P., et al. (2013). Genetic risk factors for body mass index and obesity in an ethnically diverse population: results from the Population Architecture using Genomics and Epidemiology (PAGE) Study. Obes. Silver Spring Md 21, doi:10.1002/oby.20268. Chang, M., Ned, R.M., Hong, Y., Yesupriya, A., Yang, Q., Liu, T., Janssens, A.C.J.W., and Dowling, N.F. (2011). Racial/Ethnic Variation in the Association of Lipid-Related Genetic Variants With Blood Lipids in the US Adult Population. Circ. Cardiovasc. Genet. 4, 523–533. Waters, K.M., Stram, D.O., Hassanein, M.T., Le Marchand, L., Wilkens, L.R., Maskarinec, G., Monroe, K.R., Kolonel, L.N., Altshuler, D., Henderson, B.E., et al. (2010). Consistent Association of Type 2 Diabetes Risk Variants Found in Europeans in Diverse Racial and Ethnic Groups. PLoS Genet. 6, e1001078. Lee, S.H., Yang, J., Goddard, M.E., Visscher, P.M., and Wray, N.R. (2012). Estimation of pleiotropy between complex diseases using single-nucleotide polymorphism-derived genomic relationships and restricted maximum likelihood. Bioinformatics 28, 2540–2542. Falconer, D.S., and Mackay, T.F.C. (1996). Introduction to quantitative genetics (Essex, England: Longman). Loh, P.-R., Tucker, G., Bulik-Sullivan, B.K., Vilhjâlmsson, B.J., Finucane, H.K., Salem, R.M., Chasman, D.I., Ridker, P.M., Neale, B.M., Berger, B., et al. (2015). Efficient Bayesian mixed-model analysis increases association power in large cohorts. Nat. Genet. 47, 284–290. Yang, J., Benyamin, B., McEvoy, B.P., Gordon, S., Henders, A.K., Nyholt, D.R., Madden, P.A., Heath, A.C., Martin, N.G., Montgomery, G.W., et al. (2010). Common SNPs explain a large proportion of the heritability for human height. Nat. Genet. 42, 565–569. So, H.-C., Li, M., and Sham, P.C. (2011). Uncovering the total heritability explained by all true susceptibility variants in a genome-wide association study. Genet. Epidemiol. n/a - n/a. Vattikuti, S., Guo, J., and Chow, C.C. (2012). 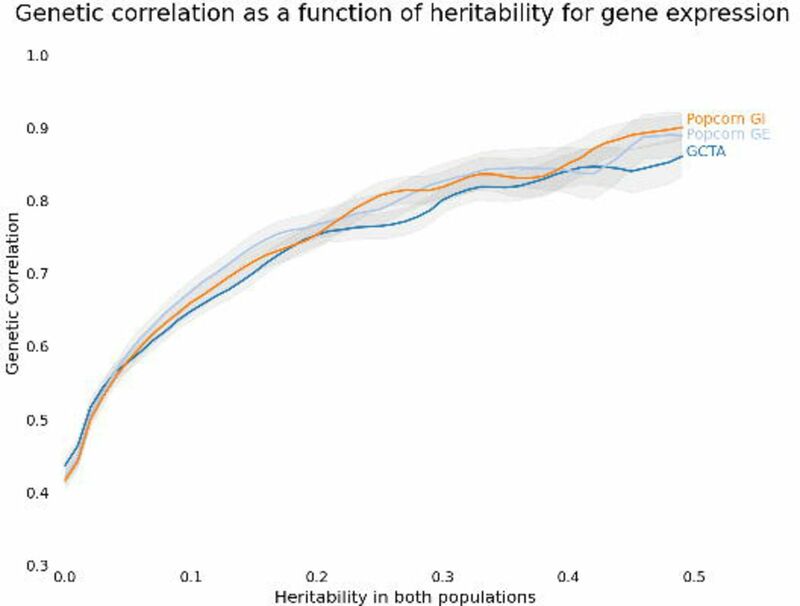 Heritability and Genetic Correlations Explained by Common SNPs for Metabolic Syndrome Traits. PLoS Genet. 8, e1002637. ’t Hoen, P.A.C., Friedländer, M.R., Almlöf, J., Sammeth, M., Pulyakhina, I., Anvar, S.Y., Laros, J.F.J., Buermans, H.P.J., Karlberg, O., Brännvall, M., et al. (2013). Reproducibility of high-throughput mRNA and small RNA sequencing across laboratories. Nat. Biotechnol. 31, 1015–1022. Morris, A.P., Voight, B.F., Teslovich, T.M., Ferreira, T., Segrè, A.V., Steinthorsdottir, V., Strawbridge, R.J., Khan, H., Grallert, H., Mahajan, A., et al. (2012). Large-scale association analysis provides insights into the genetic architecture and pathophysiology of type 2 diabetes. Nat. Genet. 44, 981–990. Cho, Y.S., Chen, C.-H., Hu, C., Long, J., Hee Ong, R.T., Sim, X., Takeuchi, F., Wu, Y., Go, M.J., Yamauchi, T., et al. (2012). Meta-analysis of genome-wide association studies identifies eight new loci for type 2 diabetes in east Asians. Nat Genet 44, 67–72. Su, Z., Marchini, J., and Donnelly, P. (2011). HAPGEN2: simulation of multiple disease SNPs. Bioinformatics 27, 2304–2305. Chang, C.C., Chow, C.C., Tellier, L.C., Vattikuti, S., Purcell, S.M., and Lee, J.J. (2015). Second-generation PLINK: rising to the challenge of larger and richer datasets. GigaScience 4,. Lee, S.H., Wray, N.R., Goddard, M.E., and Visscher, P.M. (2011). Estimating Missing Heritability for Disease from Genome-wide Association Studies. Am. J. Hum. Genet. 88, 294–305. Speed, D., Hemani, G., Johnson, M.R., and Balding, D.J. (2012). Improved Heritability Estimation from Genome-wide SNPs. Am. J. Hum. Genet. 91, 1011–1021. Yang, J., Bakshi, A., Zhu, Z., Hemani, G., Vinkhuyzen, A.A.E., Lee, S.H., Robinson, M.R., Perry, J.R.B., Nolte, I.M., van Vliet-Ostaptchouk, J.V., et al. (2015). Genetic variance estimation with imputed variants finds negligible missing heritability for human height and body mass index. Nat. Genet. 47, 1114–1120. Price, A.L., Helgason, A., Thorleifsson, G., McCarroll, S.A., Kong, A., and Stefansson, K. (2011). Single-Tissue and Cross-Tissue Heritability of Gene Expression Via Identity-by-Descent in Related or Unrelated Individuals. PLoS Genet. 7, e1001317. Gaffney, D.J. (2013). Global Properties and Functional Complexity of Human Gene Regulatory Variation. PLoS Genet. 9, e1003501. Stahl, E.A., Wegmann, D., Trynka, G., Gutierrez-Achury, J., Do, R., Voight, B.F., Kraft, P., Chen, R., Kallberg, H.J., Kurreeman, F.A.S., et al. (2012). Bayesian inference analyses of the polygenic architecture of rheumatoid arthritis. Nat. Genet. 44, 483–489. Marenberg, M.E., Risch, N., Berkman, L.F., Floderus, B., and de Faire, U. (1994). Genetic susceptibility to death from coronary heart disease in a study of twins. N. Engl. J. Med. 330, 1041–1046. Nora, J.J., Lortscher, R.H., Spangler, R.D., Nora, A.H., and Kimberling, W.J. (1980). Genetic-epidemiologic study of early-onset ischemic heart disease. Circulation 61, 503–508. Chen, X., Kuja-Halkola, R., Rahman, I., Arpegârd, J., Viktorin, A., Karlsson, R., Hägg, S., Svensson, P., Pedersen, N.L., and Magnusson, P.K.E. (2015). Dominant Genetic Variation and Missing Heritability for Human Complex Traits: Insights from Twin versus Genome-wide Common SNP Models. Am. J. Hum. Genet. 97, 708–714. Zhu, Z., Bakshi, A., Vinkhuyzen, A.A.E., Hemani, G., Lee, S.H., Nolte, I.M., van Vliet-Ostaptchouk, J.V., Snieder, H., Esko, T., Milani, L., et al. (2015). Dominance Genetic Variation Contributes Little to the Missing Heritability for Human Complex Traits. Am. J. Hum. Genet. 96, 377–385. Marchini, J., and Howie, B. (2010). Genotype imputation for genome-wide association studies. Nat Rev Genet 11, 499–511. Ma, R.C.W., and Chan, J.C.N. (2013). Type 2 diabetes in East Asians: similarities and differences with populations in Europe and the United States: Diabetes in East Asians. Ann. N. Y. Acad. Sci. 1281, 64–91.